Save Marinwood-Lucas Valley - our community, our future: Wake up, The MTC/Cal Trans is planning this New York Style Tax on YOU! Wake up, The MTC/Cal Trans is planning this New York Style Tax on YOU! Editor's Note: New York Style "congestion tax" is being planned for San Francisco. Steve Kinsey, Marin Supervisor is a big advocate of "ramp metering" which is likely to include a "use fee". Motorists will be stuck paying for the "King's Highway" until these politicians are removed from office. The growing Move NY coalition has released its final plan—and it has signs of a winner. The dream of road pricing will never die in New York, and on Tuesday it got a new injection of life. 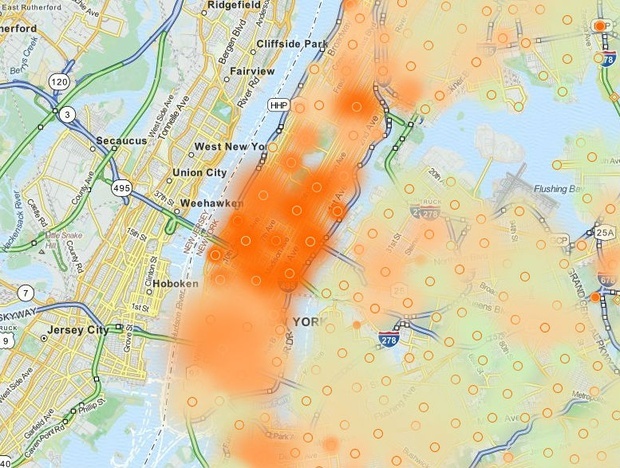 Move NY, a rapidly expanding coalition involving former city traffic engineer Sam Schwartz, released its "final" plan to charge drivers for the congestion they create heading into Manhattan's central business district. The new revenue stream—upwards of $1.5 billion a year—will go toward funding much-needed transportation maintenance and expansion projects across the city. "It has finally sunk in that the feds will be little or no help," Schwartz tells CityLab. "We, as do all local governments, need home-grown solutions." 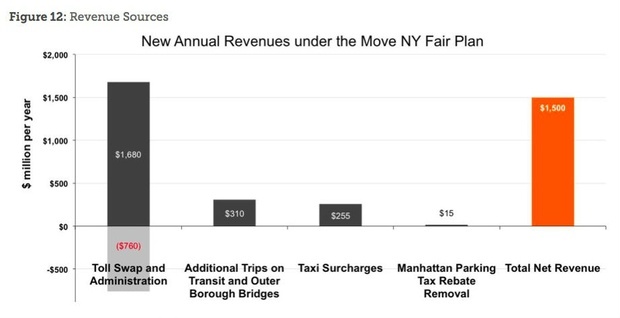 Precise toll prices aside, the details are more or less the same as when weexamined the initial plan last March: drivers will pay to cross the four (currently free) East River bridges and also to go below 60th Street in Manhattan. Given the failed history of traffic pricing in New York—most notably the 2008 plan by then-Mayor Bloomberg that came up short—it's easy to be skeptical about Move NY's chances. But here are six reasons to think it will succeed. Last fall the Metropolitan Transportation Authority announced a $32 billion capital plan to improve New York's transit, bridge, and tunnel from 2015 to 2019. The MTA plan outlines key projects for the city, including the second phase of the emerging Second Avenue subway line, an expanded rapid bus network, and improvements to Penn Station and Grand Central. But with only about $16.8 billion in hand, that already-conservative outlook is set to come up $15.2 billion short. To make matters worse, the MTA's debt is growing, and fast. 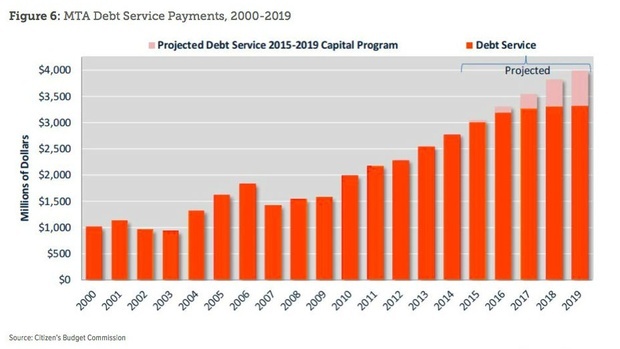 Move NY points out that debt services accounted for 17 percent of the agency's 2014 operating budget; that means for every dollar New Yorkers paid in tolls and fares, 17 cents went to creditors instead of the transportation system. If the MTA borrowed the money needed for its capital plan, tolls and fares would need to rise an estimated 15 percent—on top of the scheduled 4 percent bump. So New York needs transportation money. Bad. Move NY is offering $1.5 billion and points out that no one else "has identified a viable means of filling the gap." You'd be hard-pressed to find a transportation expert in the city who would disagree. You've probably heard that Sheldon Silver's long run as speaker of the New York State Assembly came to an end earlier this year amid corruption charges. But what you might not recall is that Silver was the last barrier to Bloomberg's 2008 push for traffic pricing—blocking the plan from getting a vote. Sam Schwartz tells CityLab that Move NY is encouraged by Silver's replacement as speaker, Carl Heastie. "Heastie has shown support as an Assemblyman," says Schwartz. "We're optimistic in his new role." The Move NY plan urges the state legislature to created a new agency under the MTA's domain called the "Move NY Highway and Transit Authority." (You know, the MNYHTA!) The new authority would have the power to set and impose tolls on the crossings into downtown Manhattan, likely beginning in 2017 or 2018. Move NY also wants any new law to establish a "permanent ratio" that keeps outer tolls lower than those heading into the central business district. Last year, Move NY chief Alex Matthiessen told CityLab the group was making a "public listening tour"—with a special effort to target former opponents of traffic pricing. That outreach campaign seems to have worked. Schwartz says several adversaries of the old Bloomberg plan seem to be on board with the new one, including AAA, the New York State Motor Trucking Association, and the Staten Island Chamber of Commerce. using the money to fill transit gaps and fix our roads and bridges, we finally have a plan that my constituents can get behind. New Yorkers just want to be treated fairly. As long as we get a fair slice of the benefits, we’re willing to pay our fair share to support investments in our vital transportation infrastructure," he stated. Some of the shift in support is no doubt due to Move NY's emphasis on equity. Drivers in the outer boroughs will no longer feel slighted (well, as slighted) by the city's toll imbalance. Transit service will improve on the existing system and expand to places where service is either poor or non-existent. Taxi users—and that includes users of Uber and other ride-hail services—will contribute their share with a surcharge. A parking tax exemption "enjoyed only by Manhattan residents" will also be eliminated. Travel speeds will increase 15 to 20 percent in midtown and downtown. And, of course, everyone will get where they're going faster: travel speeds will increase 15 to 20 percent in midtown and downtown. The plan also seems to have improved since last year—particularly with regard to dynamic pricing. Rather than charging one flat toll rate on bridges and the 60th Street cordon, the new plan recommends a demand-based pricing system that varies by time of day. So drivers who enter the city core during weekday rush hour, for instance, will pay more than those who come on weekends or evenings when traffic is lighter. New York is serious about eliminating traffic deaths and enhancing traffic safety, and traffic pricing will help the city get there. The Move NY plan points out that between August 2011 and February 2014, many of New York's most dangerous intersections were located near the four free East River bridges that attract so many drivers today (below). By distributing toll prices more evenly across the city, the intense fight for space on those bridges should diminish—and crashes with it. The quality of New York's roads is declining, too. Move NY notes the following hardly-fun safety facts: about 12 percent of the state's bridges were classified as "structurally deficient" as of 2013; 30 percent of city roads are in "fair" or "poor" condition (up from 16 percent in 2000), and 51 percent of state highway lanes located in the city are in "fair" or "poor" condition (up from 38 percent in 2008). Oh, and more than half of the MTA's bridges and tunnels are over 70 years old. In New York, as elsewhere, the infrastructure crisis is really a maintenance crisis. 6. Everyone Else Is Doing It! Cities around the world are making big strides toward reducing congestion in their cores. London, Stockholm, and Singapore have been running successful traffic pricing programs for years. Madrid and Paris are among the global cities pushing progressive plans to restrict driving in city centers. Eventually some major U.S. metro will join this fight against urban congestion. Where better to start than New York?